Hola Lexicans! As promised in my last post today I will be answering by Q&A questions - thank you so much for everyone who commented and emailed me lots of questions, unfortunately I can't answer all of them, but I'll do as many as I can. This is just meant to be a funny post and ENJOY! I blog, eat cookies, read, stalk people on Instagram, eat cookies, ride dragons, eat cookies and write, oh and I think I forgot eating cookies. How would you describe yourself in 1 word? I either eat (preferably cookies), or I go on musical.ly, Instagram, Twitter or Pinterest. Well, it depends, if it were just for a day, I would probably switch with one of my teachers to see what it is like as a teacher, but if it were forever, I wouldn't want to switch with anyone. I'm going to try and right something really awe-inspiring and get to the end as see the word cookies twice in the paragraph probably. The purpose of blogging is to share your thoughts and opinions with other people and get your voice heard. Since blogging I have felt a lot more confident and my voice has been heard by so many more. Also can someone count how many times I used the word 'cookie' or 'cookies' in this post? Yay! my question was answered! 9 times, including the "can someone count how many times i used the word cookie or cookies in this post?" without including those, 7. I like to ride dragons in my freetime, too. XD And don't stop talking about cookies; I'm like that, except with brownies, because brownies are the only things that I cannot mess up in the kitchen. 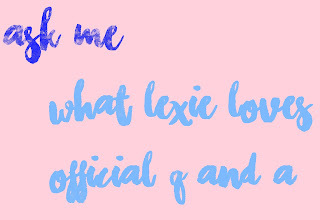 Great post Lexie!! I love cookies too. Especially chocolate chip cookies!! !